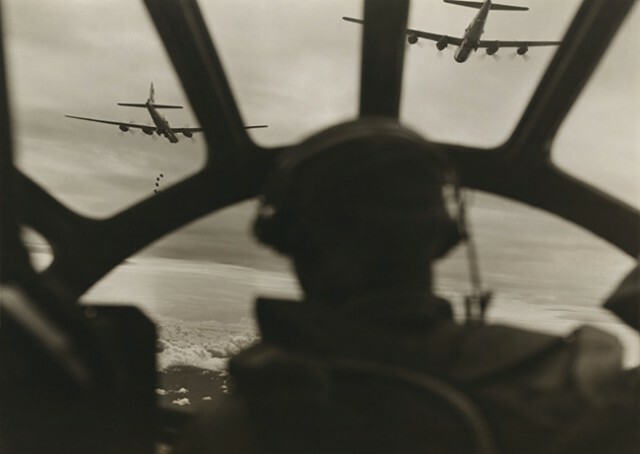 Most prospective aviators are excited about joining Lindberg, Yeager and Hoover in the sky, but they’re usually less enthusiastic about investigating the ways of weather, at least until they start flying places. In this case when we say “weather,” we’re talking mostly wind. For safety’s sake, we need to understand the movement of fronts, development of thunderstorms, the hazards of fog and ice, and the myriad of other weather phenomenon about which meteorologists wax poetic, but even if conditions are CAVU from point of departure to destination, winds affect almost every flight. The good news is that it’s easy to find wind and winds aloft information these days, whether it’s from an official briefer, the internet, a handy app or even from the TV. We don’t necessarily need to become diagnosticians of winds in order to understand how to turn weather information to our advantage. Pilots flying short hops on Sunday mornings for pancakes or burgers may not need to do more than look out the window to make a reasonable go/no go decision, but aviators planning cross-country flights to far horizons need to understand what they’ll be getting into well before they get into it. That need becomes especially acute when the distance extends from 50 or 100 miles to 500 nm or more. A more comprehensive forecast becomes essential when the trip exceeds known parameters, ranging from across town or state to across a continent. That’s because individual weather fronts are usually confined to a comparatively small area. Extend your reach to 1,000 nm, and you may fly through several systems with winds blowing in different directions. Flight planning over long distances requires a careful analysis of winds aloft. The uninitiated might expect the laws of probability to produce headwinds and tailwinds with roughly the same frequency, effectively canceling each other. Not so. 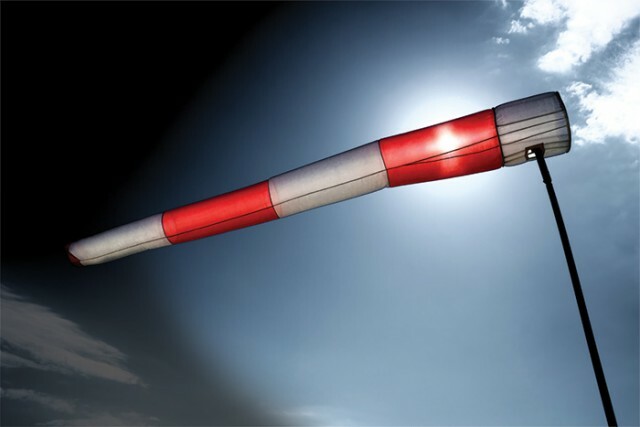 Fly a one-way trip in a consistent direction over 300 nm or less, and variable winds aloft may not present much of a problem, but if you’re planning an out-and-back over any distance or a hop longer than 500 nm, you’d best be aware of winds at every point and every altitude along your route. The uninitiated might expect the laws of probability to produce headwinds and tailwinds with roughly the same frequency, effectively canceling each other. Not so. In the Northern Hemisphere, wind patterns are predominately west to east. That might suggest you’ll usually break even if you’re flying a semi-horizontal track above the equator. As many of us learned in flight school, however, even a direct tailwind will be more than offset by a direct headwind on the return leg. That’s because a headwind acts on the airplane longer than does a tailwind. 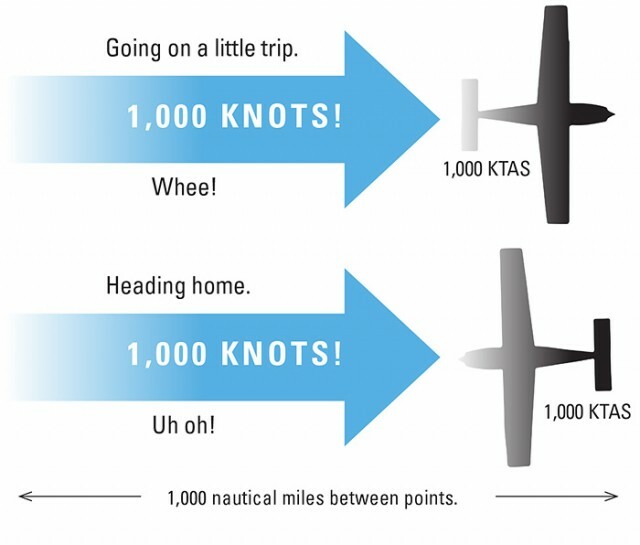 A simple example is a 100-knot airplane flying into a 20-knot headwind on a 200 nm trip. Time enroute will be 2+30 for such a trip. The return leg, with a 20-knot tailwind, will demand only 1+40. That’s a total of 4+10. In no-wind conditions, the same airplane would need only four hours for the round trip. No matter what combination of wind speed, wind direction and aircraft speed you choose, the result is always the same. As long as all other factors remain constant, you lose. Any consistent wind on a round- trip flight will always reduce your net groundspeed. That’s because any tailwind will never save as much time as a headwind will lose. Even a direct crosswind will resolve to a headwind component. In other words, you’re actually better off with no wind at all, rather than any consistent wind. Run a few test situations through your electronic E6B, and you’ll find that you won’t begin to realize any significant benefit from tailwinds unless they blow from the aft 160 degrees. The forward 200 degrees, including 10 degrees on each side from the aft quadrants, are universal losers or break even at best. Of course, smart pilots might be able to cut their losses by flying as high as possible on any leg with a push; then, cruise lower operating into a headwind on the return. Another possible method of reducing total time enroute, at least for those strange folks who buy a fast airplane to fly slow, is to increase power on a headwind leg to reduce the total time enroute. This isn’t terribly efficient in terms of fuel burn, but it can help you make up some of the time lost to winds. Just as with life, airline fares and the IRS, no one ever promised winds would be fair. The airlines appreciate this phenomenon better than anyone, and they’ll sometimes fly pressure patterns, i.e. displace course lines as necessary to realize better winds aloft. Pressure pattern flying is obviously most advantageous to high-speed aircraft operating in the upper flight levels. It also can be beneficial to general aviation in the middle altitudes and bottom of positive control, Type A airspace. I rarely subscribe to pressure pattern flying, as I’m usually operating non-RVSM-approved aircraft below 250 knots. By definition, I’m at or below FL280, so I’m rarely exposed to the super winds of tall altitudes. There are a few other tricks to wind management that some pilots use. One is to always think “right” when approaching a weather system that you’d rather fly around than through or under. By definition, weather usually brings with it low pressure, and as mentioned above, that means counter-clockwise flow. If you need to circumnavigate weather rather than charge through it, always favor the right side if terrain permits, as that’s more likely the tailwind direction. Also, while flying below a broken layer, take a tip from glider pilots and amend your route very slightly to fly beneath the major buildups rather than aim for the patches of clear sky. When I was training for the sailplane rating many years ago, I learned that glider enthusiasts call these clear sections “blue holes” and know they signify areas where the sky truly is falling. In other words, you’ll very likely encounter downdrafts beneath the blue holes and experience updrafts under the major cloud formations. You should be better able to maintain cruise speed if you’re not fighting downdrafts, another factor that can make it more efficient to reach your destination. Life isn’t fair. Here’s proof. This graphic shows the same plane going on an out-and- back trip with identical winds. While the trip out gets the benefit of a nice push, the punishment on the return trip makes it hardly worthwhile. Winds just don’t balance out. As the graphic shows, at 1,000 knots true airspeed with a windspeed of, likewise, a breezy 1,000 knots, a trip of 1,000 nm will take a mere half hour (1,000 nm/2,000 knots ground speed). Nice. The return trip won’t be as pleasant. With 1,000 knots on the nose, our sad pilot will never get home (1,000 nm/at zero ground speed—hovering until the gas runs out). We’d suggest turning around. Paris is nice. Wind aloft forecasting would be considerably simpler if all you had to deal with was consistent west-to-east flow. Unfortunately, the diabolical weather gods weren’t about to make it that easy. Topography and Coriolis effect induce winds to perform sometimes weird tricks that you may not be able to predict. In my home state of Alaska, Mt. Denali and Mt. Foraker, huge monsters of granite and ice located near the geographic center of the state, disrupt and deflect “normal” west to east weather flow. These sometimes confuse weather patterns in Fairbanks, 100 miles north, and Anchorage, 130 miles south. The mountains are infamous for making their own weather, molding the winds to fit their contour, reshaping the sky from its normal horizontal pattern to a decidedly south/north flow. Years ago, on an amazingly clear day, with Anchorage Center’s permission, I flew a Cheyenne III across the rounded dome of McKinley (recently renamed Denali) at 20,400 feet, 80 feet above the peak, all for no better reason than I could. The wind was atypically dead calm, so the mountain apparently didn’t mind my indignity. As I turned back toward Point Barrow and climbed back up to FL270, Center asked about the ride, then, popped my bubble by advising a low level McKinley overflight was a common request on exceedingly rare, windless days. Coriolis effect, the spin of the Earth, also tends to bend the sky from longitude to latitude. In the northern hemisphere, Coriolis turns weather systems stubbornly toward the Pole, often with amazing strength above 30 degrees north. In Winter, this can result in extreme southerly winds, and unless you can stop the Earth’s rotation, there’s little you can do but go with the flow. Managing winds can be a game of inches, however. You can help maximize efficiency by managing climbs and descents more intelligently. If the breeze is friendly up high and the cylinder head temps are willing, climb at Vy or perhaps Vy plus 10 to reach the favorable winds as quickly as possible. Levitating into headwinds, I’ll fly a cruise climb at Vy plus 20 or 25 to maximize distance traveled for time spent. Similarly, at the opposite end of a tailwind trip, I’ll maintain altitude as long as possible, then descend at a good clip with speed brakes deployed to destination. I didn’t major in psychology, but I have a theory that another reason we see more headwinds than tailwinds is that we simply tend to remember them more readily. I like to analogize the art of psyching out winds aloft to what I call Murphy’s Law of Freeway Lane Choice; Whatever lane you’re in will always be the slowest. Sadly, the same disappointment often awaits us pilots when we arrive at that altitude we guessed would have the most favorable winds. Happily, like ill-fated lane-gambling motorists, we can always try a different altitude, too.